I have been working on Dave’s Collection page for 3 weeks. I was trying to figure out why it loaded so slow. Sure, it has a lot of pictures, but that was not it. I found out all the images on the page were 2448 x 3264 pixels which is the default on my cousins’ camera on his phone. While resizing them my image editor says they are 30 MB each in PNG format in the original dimensions, but that cant be right. So 145 images at 30 mb would be 4.35 gb right? No wonder the page takes so long to load. I checked the format and it looks like he used JPEG format which brought them down to 2MB each on the 2448 x 3264 pixels. Still, 290 MB of images on the page would take forever to load. I may need to reconsider using PNG files if they are space hogs. Anyway, sorry there hasn’t been any new robot posts on the site. I have plenty to go through of my own(I even have 5 new ones. I have a Bismarck DX, Daileon DX, Machine Robo MR-02, Ninja Senshi Kurojishi DX, and a train transformer from Dave), but I have been going over my cousin’s as he puts out his posts profusely. But he is done with his entire collection, all his robots are up. But I am still slogging through the images of his Macross robots and still have to run edits on the Transformers robot images. Since I am editing his images, I might as well fix his posts to use the newer images so they load quicker too. I will eventually put up my G1 Transformers, G2, Beast Wars, Machine Wars, Jumbo Machinders, Macross, various other Japanese robots and the rest of my Shogun Warriors. I tend to be more meticulous and spend more time on my comments and images than Dave. This is a pretty nice Toys R’ Us exclusive. 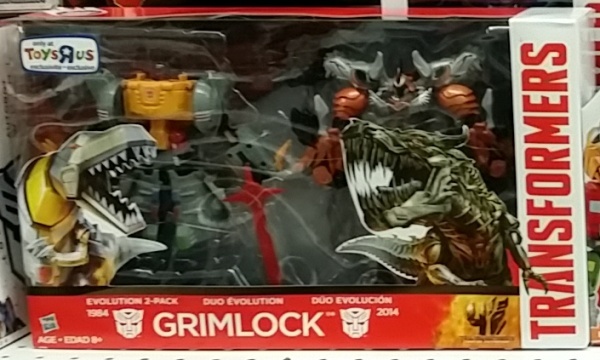 The Transformers Age of Extinction Grimlock Evolution 2-Pack comes with a classic Generation 1 like Grimlock based on the classic 1984 cartoon and the Age of Extinction 2014 version from the movie. 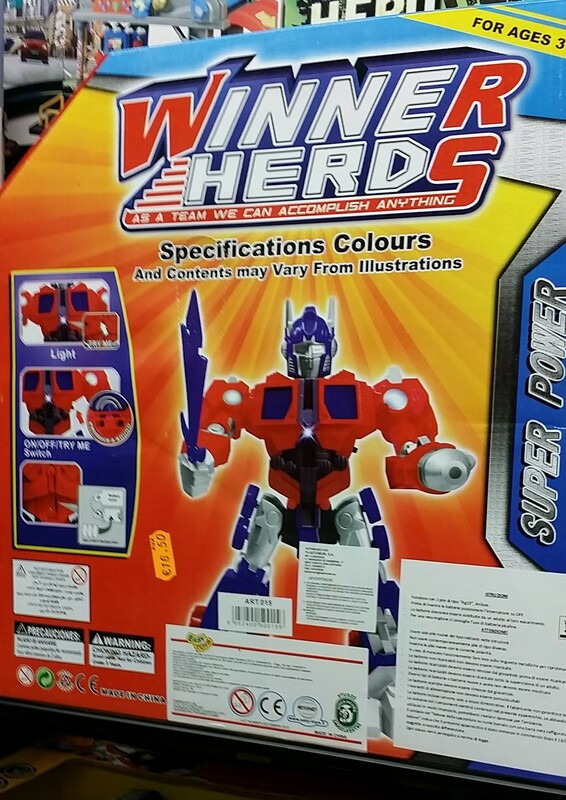 If you don’t want to pay big money for a G1 Grimlock, here is a cheaper option you can pick. I do not have Grimlock yet, so it is an option I am thinking about. 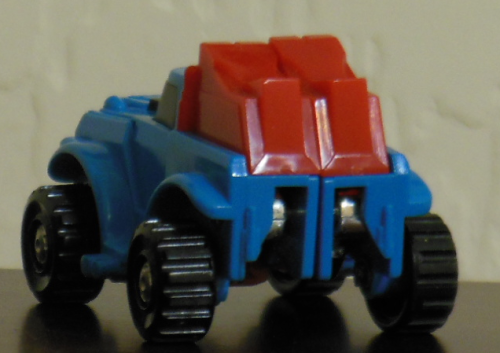 I have been eyeballing the dark blue Generation 2 Grimlock as my cousin already has the G1 version. But what I like about this one is that the head is not a teeny weeny wee little thing like the original Generation 1 release. The new Grimlock looks really nice, but I haven’t gotten around to seeing the movie yet. So I do not have any attachment to it like I do for the G1 Grimlock redux. 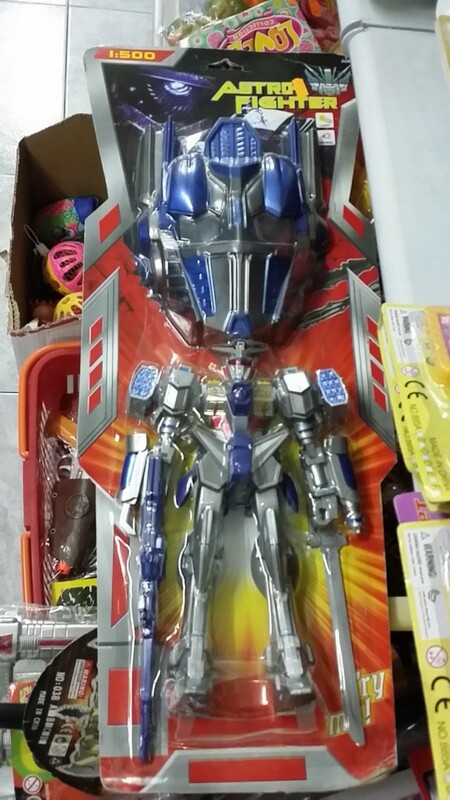 Both robots change to Dino mode or into a tyrannosaurus rex. 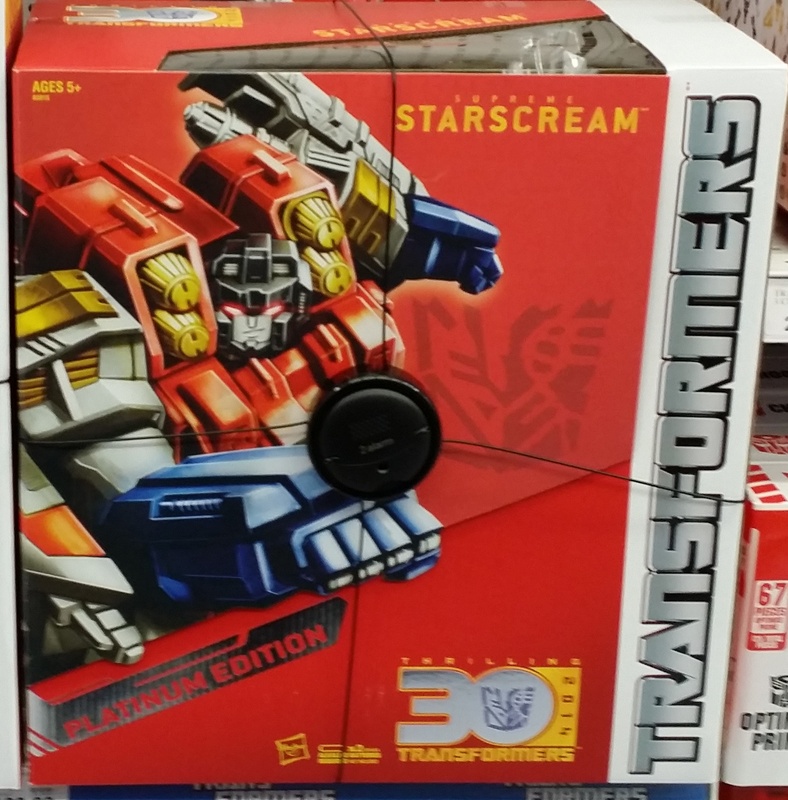 I found these Platinum Series Optimus Prime & Supreme Starscream at the local Toys R’ Us. Both are repaints of previous releases, which is disappointing. You would think on the 30th Anniversary, they would provide us with some new products. I don’t care much for the gold grill on Optimus Prime, but it is a marvelous piece aside from that. 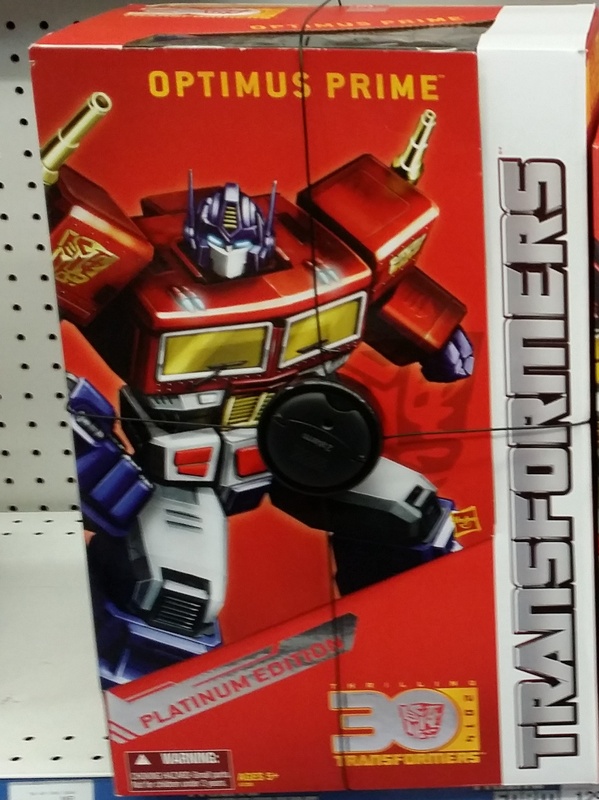 I really do not understand why some robots are re-released in gold versions. They all look terrible. 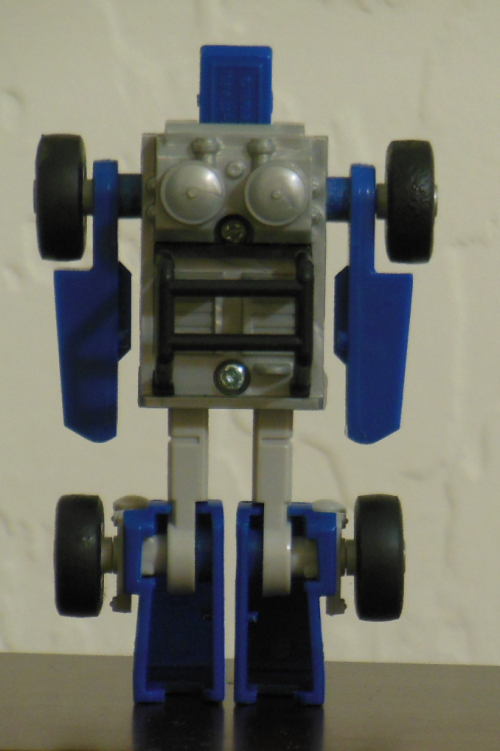 I went through all my robots and found out I do not yet have a G1 version of Optimus Prime. I am sure they will issue another 2 or 3 in the next 5 years so I can wait. I am tempted to save up and buy the Transformers Optimus Prime 20th Anniversary Figure as I feel it is the best Optimus G1 figure I have ever seen. Now the Starscream I am thinking about picking it up. It looks great as a robot and the ship it turns into reminds me of the Ark. 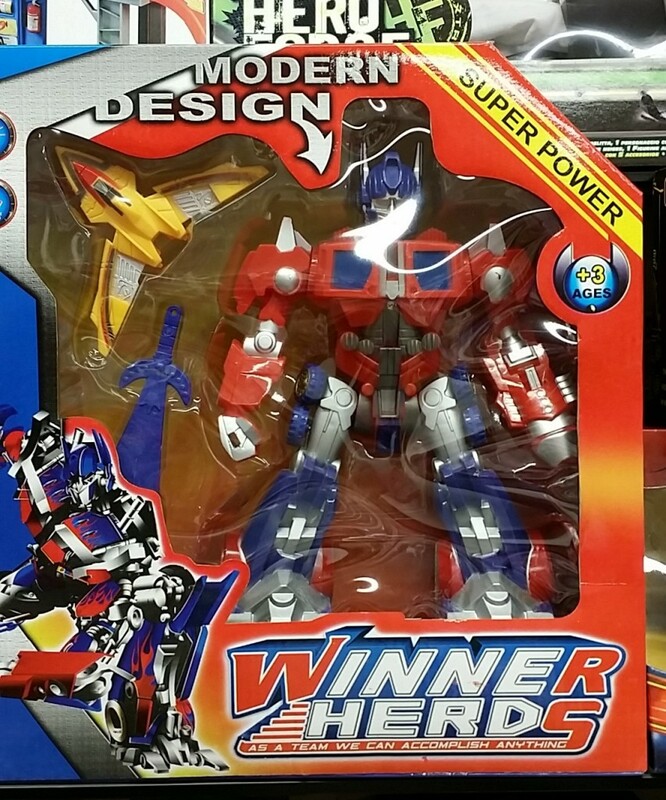 Looks like this is a shared exclusive with Big Bad Toy Store. They are both nice pieces, but the boxes are so big. I am reluctant to add a piece with such a large box. I am sure if I had the space, I would have them all. 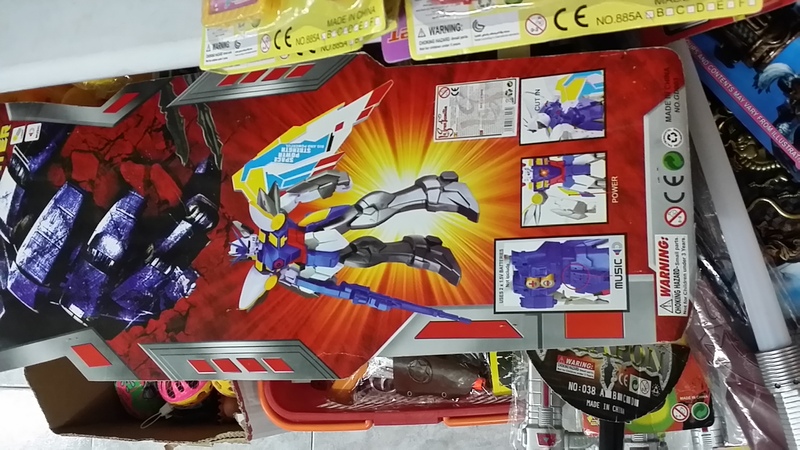 So I found this bootleg Astro Fighter Mask and robot at the same store as the last robot in Burgos Spain. I have no idea what it is. I am thinking Zone of the Enders maybe? Anyone, Buehler? 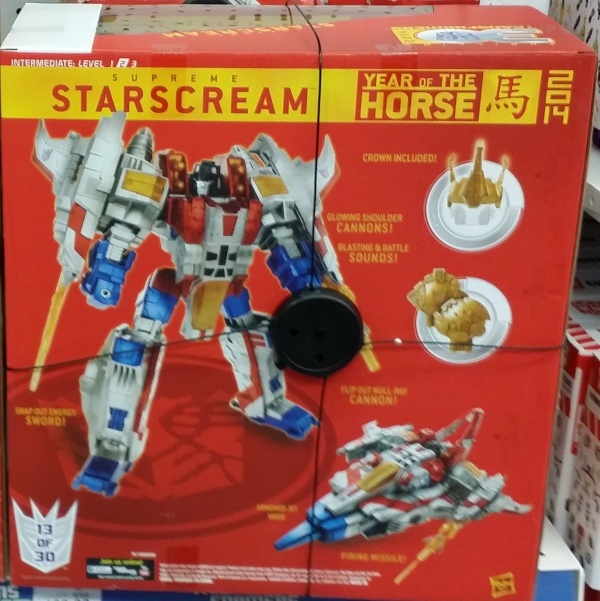 The image on the box makes me think of the Gundam with the wings. For some reason they decided to add the robot with this mask. 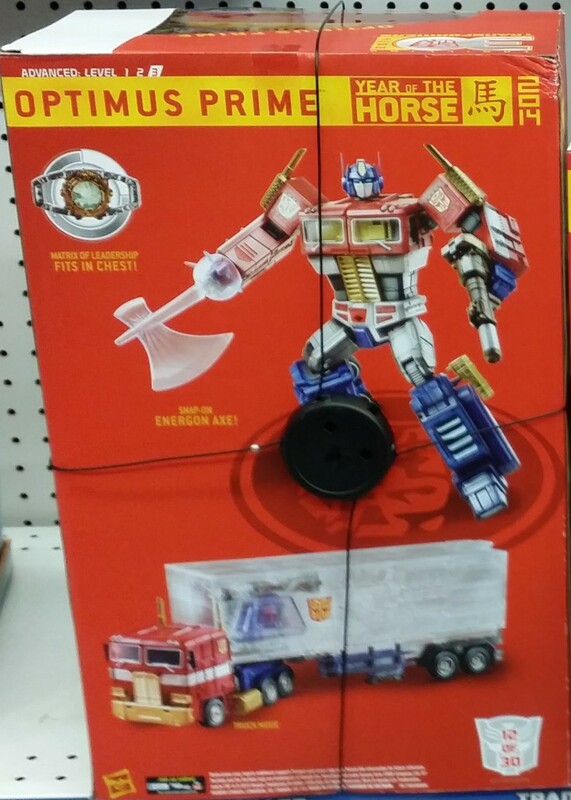 I am not even sure why you would include the robot if it is not even an Optimus Prime robot. It seems kind of random. 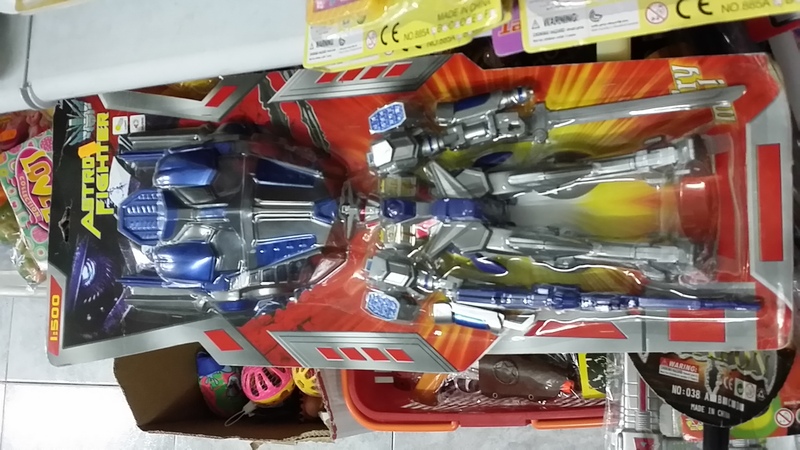 It definitely looks like the Optimus Prime mask from one of the movies. It is pretty similar to the one out now. I put in a picture of the most current one at Target above. It’s a pretty cool robot mask, but the robot looks really generic. Found an old Optimus mask that fits the bill. 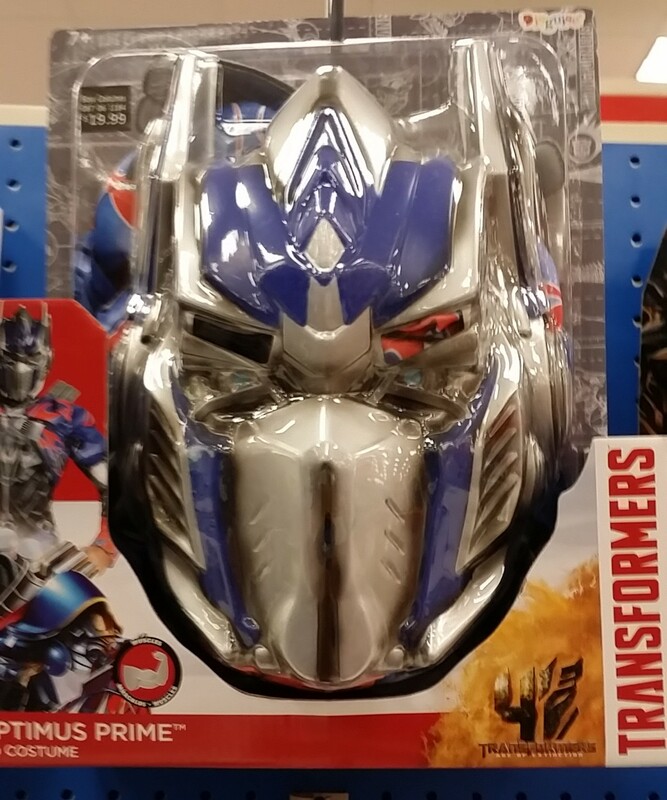 It is the Hasbro Transformers Optimus Prime Voice Changer Helmet from 2006. 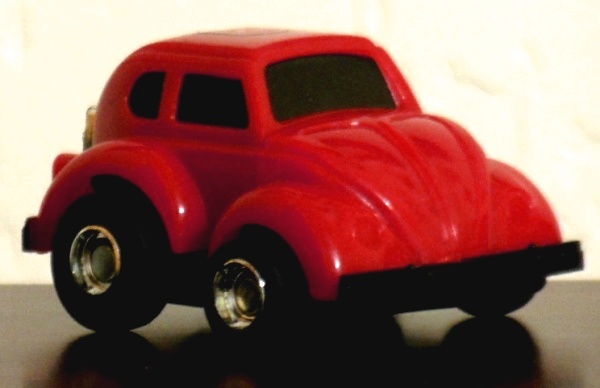 The bootleg toy is made by La Gran Familia in Spain. I think their site is gftoys.biz or the now defunct lgftoys.com. It looks really cheaply made. I wouldn’t pay €10 for it. Here is your Robot of the Week! 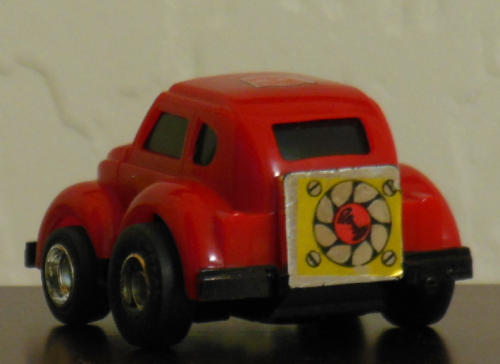 Beachcomber from the Generation 1 Transformers mini vehicles. 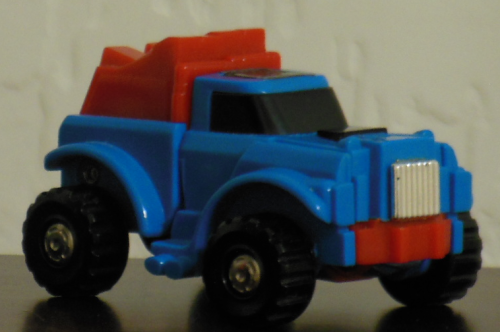 So if it looks like I am doing a run of G1 mini vehicles, you would be correct. 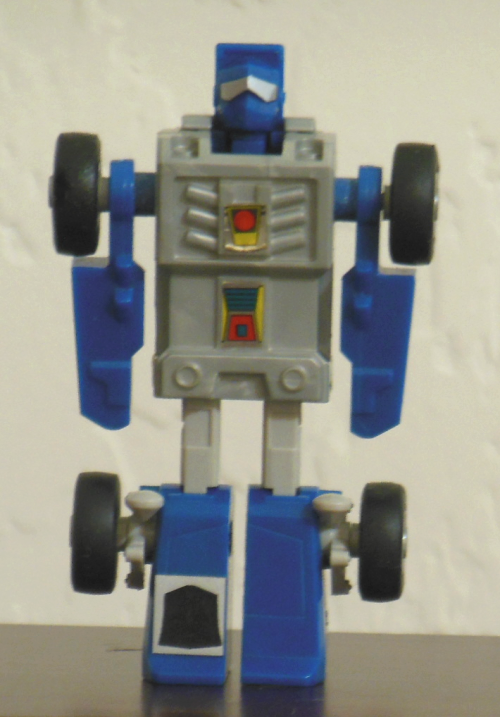 I will probably eventually do a run of Go-Bots from Generation 2 and Machine Robos when I get around to it. 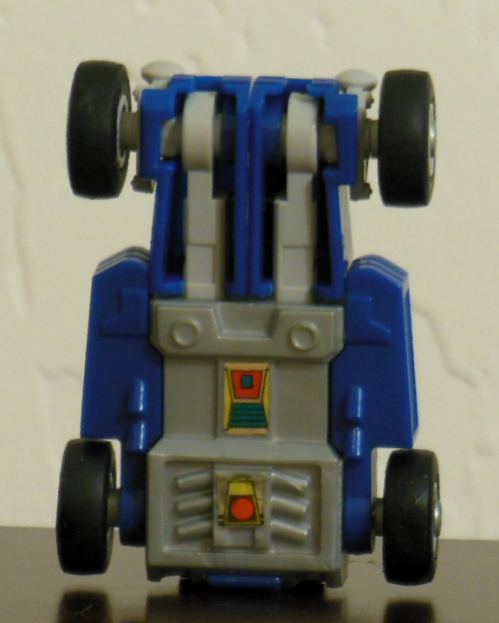 So Beachcomber is a pretty cool little robot. Stands good, you don’t have to extend the legs(like Bumblebee and Cliffjumper) which can cause issues down the line if you transform these baby’s long enough. 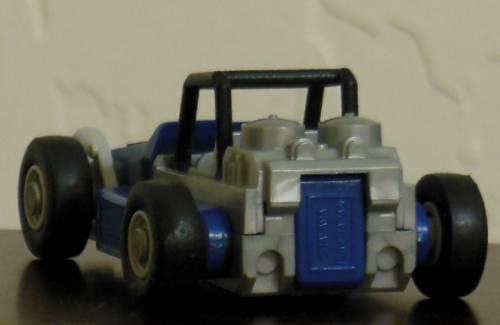 Blue and gray work pretty good colorwise for this little dune buggy. It is a simple design, but simple can take you a long way when you got a nice looking dune buggy and decent looking robot as options. The transformation is simplistic as well, but it’s nice as I have done it about 3 times while writing this little blurb. 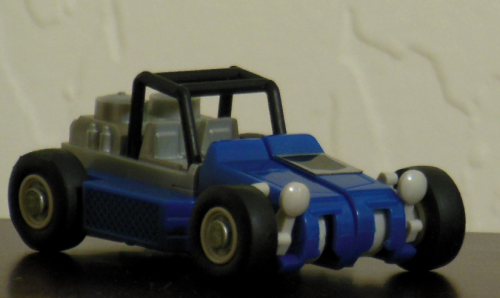 The dune buggy mode reminds me of a Lego car. 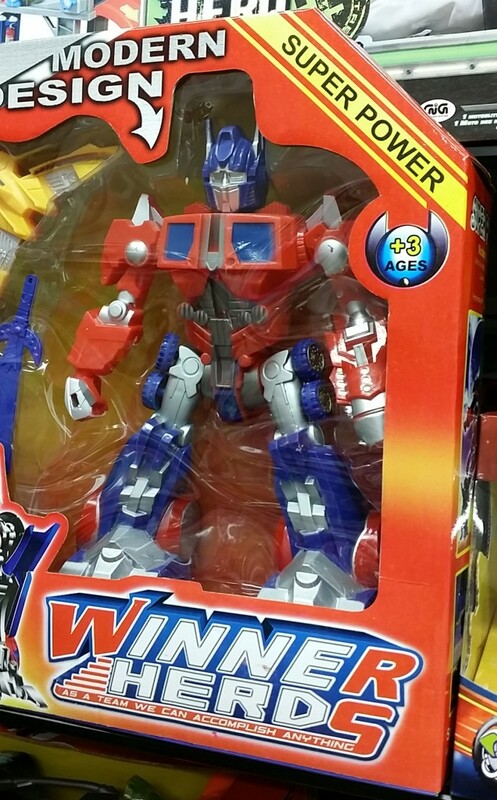 The pieces mold tightly together and you would hardly know it was a Transformers robot if not for the Autobot sticker on the hood. 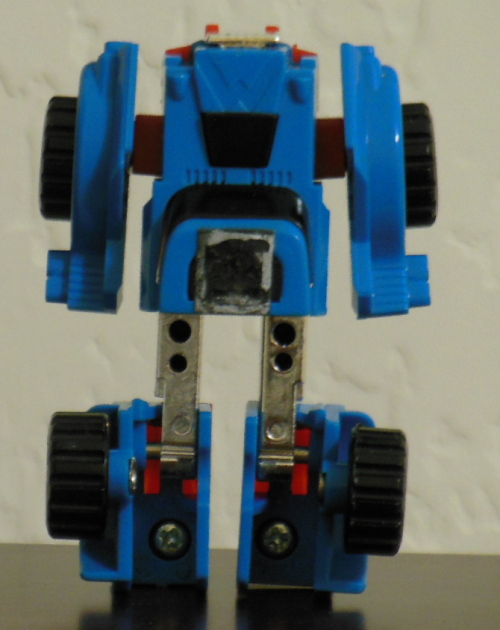 It’s a nice Generation 1 robot that really would not cost you much to add to your collection loose. 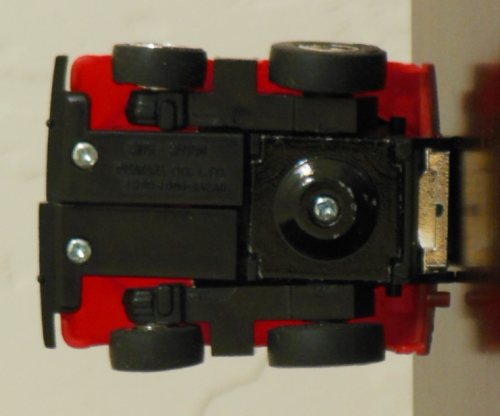 Gears is a cool little mini vehicle is a nice design and easy to transform. 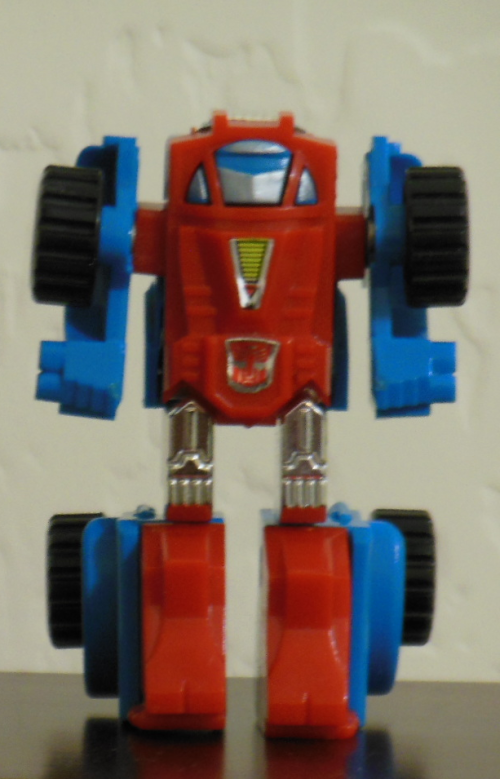 Since you don’t have to extend the legs, he stands a lot easier than say Bumblebee and Cliffjumper from the same collection of G1 mini vehicles. 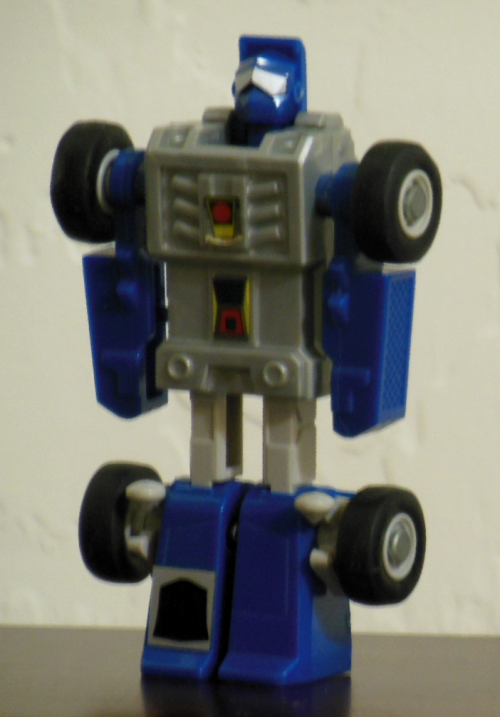 Mini vehicles in general are simplistic robots in form and transformation, but that makes them a lot of fun. I find myself transforming them back and forth as I take pictures, write about them, and research more about these pieces. 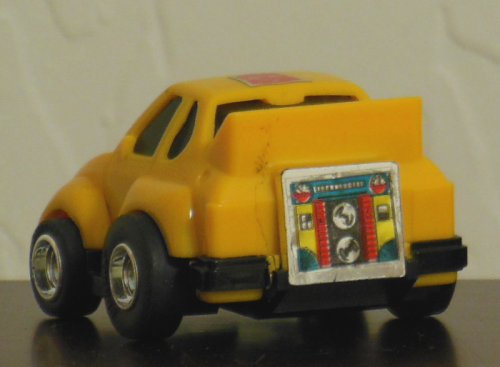 This one is in pretty good shape except for the Autobot sticker. It’s not too bad in either robot or truck form. When I first got this one, I was like nice. 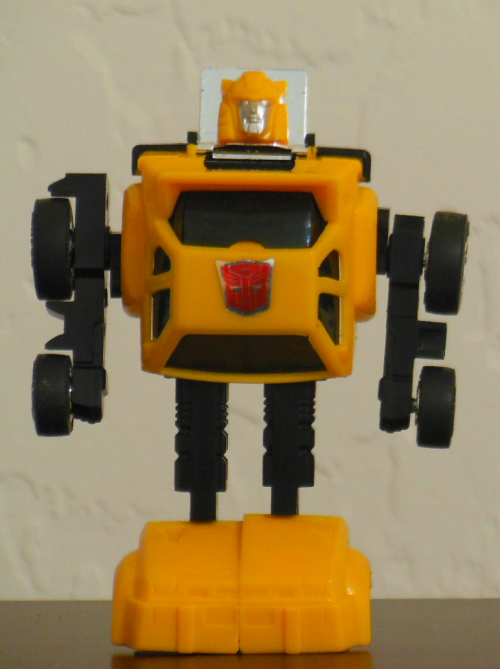 I have Bumblebee! 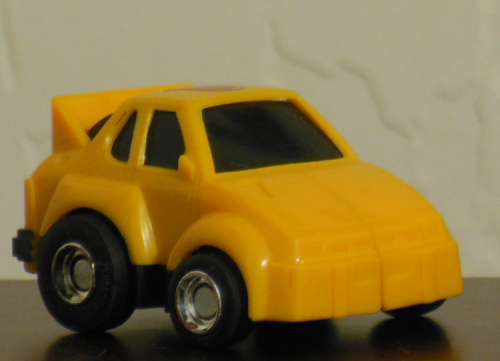 It really looks like Bumblebee from the cartoon since I have the yellow version, but it is the wrong car. Bumblebee is a Volkswagon Bug, not a Porsche Turbo. 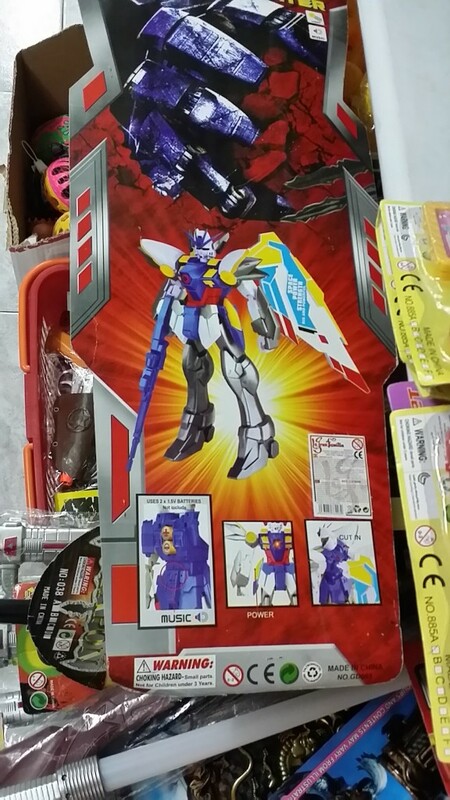 The face really looks like Bumblebee though. 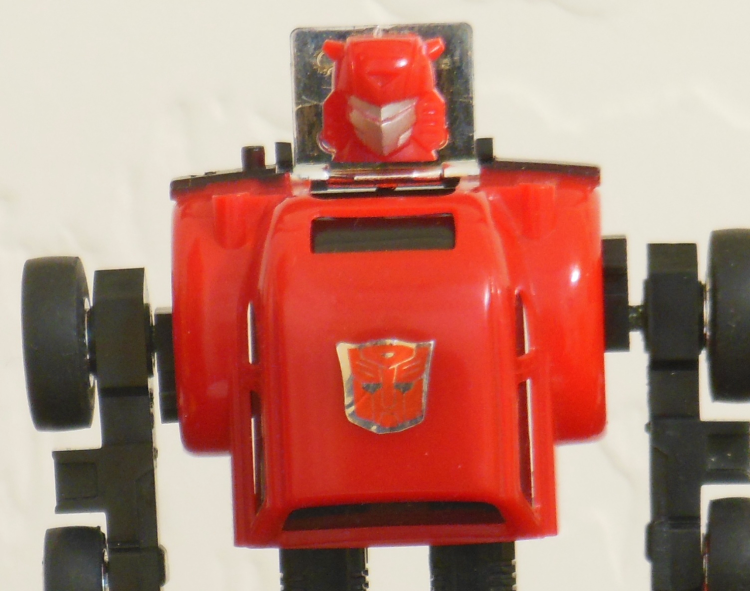 While looking this up with Bumblebee I realized I had Cliffjumper and I mixed the two up. 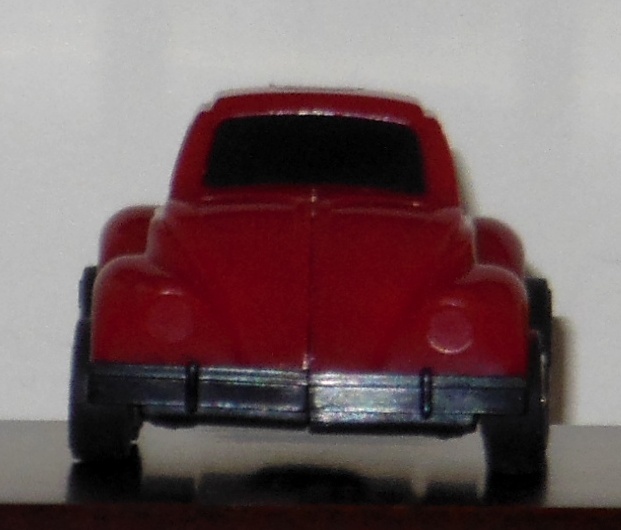 Hasbro made the choice to have Cliffjumper in red and yellow as a way to make the toy line look bigger. I dunno, six cars in the Mini Vehicles line is good enough as far as I can tell. 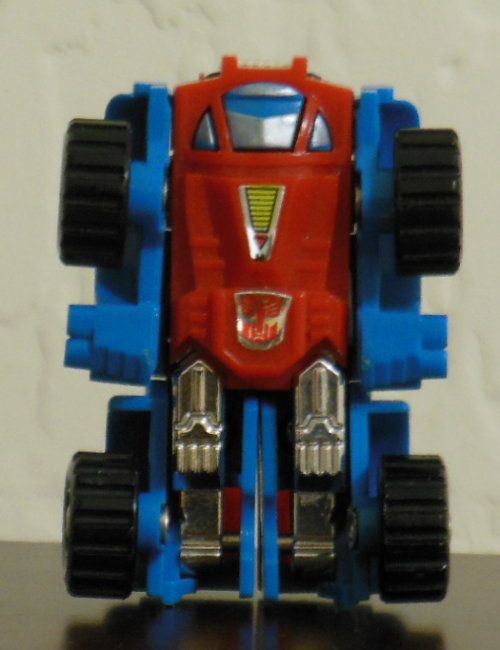 I enjoy the little guy as it is easy to transform. Not too stupid looking, but they could have put a little more effort into the hands and arms. 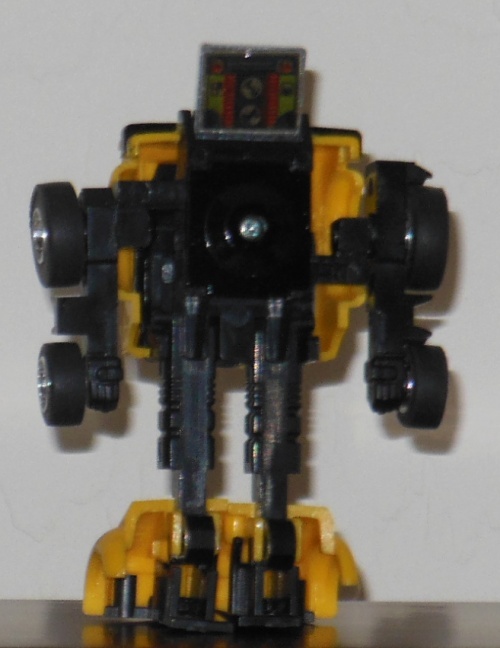 Anyway figure since these Bumblebee and Cliffjumper both transform the same way and I confused the two, they will my Robot of the Week this week. 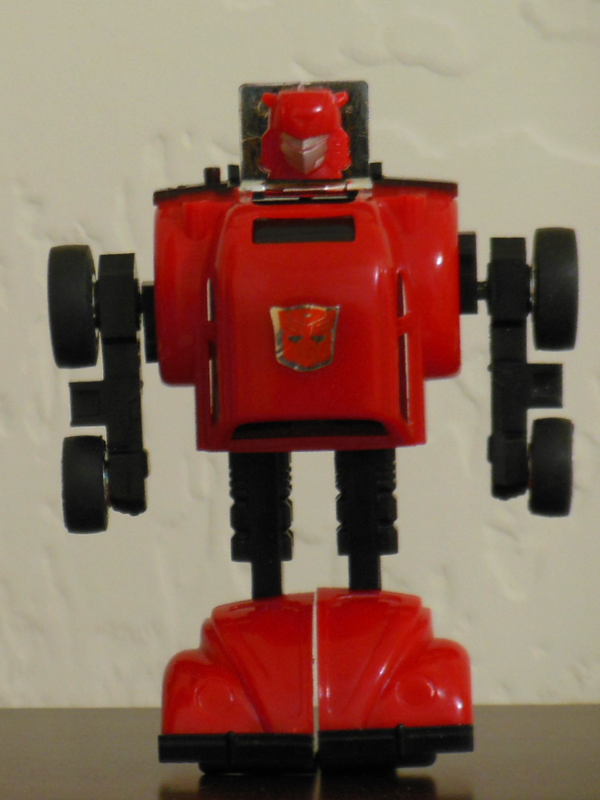 Cliffjumper’s legs are a little loose after transforming him over the years. So the joints on the arms and legs are a bit loose and he does not stand or pose as well as he used to. So I am finally getting out my Robot of the Week. Sometime this week. LOL, most likely in the next day or two. I just updated my first posts which were just images. Now I have my own take on of my collection, light review of the robot and some light commentary. As I update old posts which were only pix, I will update the publish date show they show as new posts. So on to my first Robot of the Week. 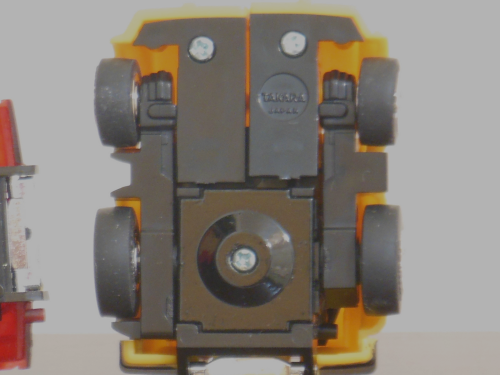 Here is a hint, this is my first Transformer post and this little robot is not always red.